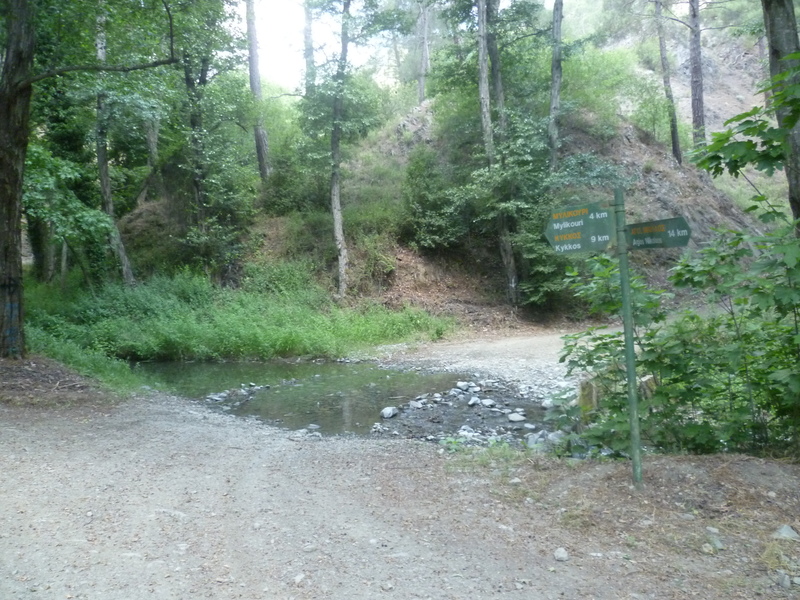 Difficulty: Quite a long walk but much of it is in shaded areas. Some ascent and descent although this is largely gradual. There are a number of opportunities for resting and refilling water bottles. 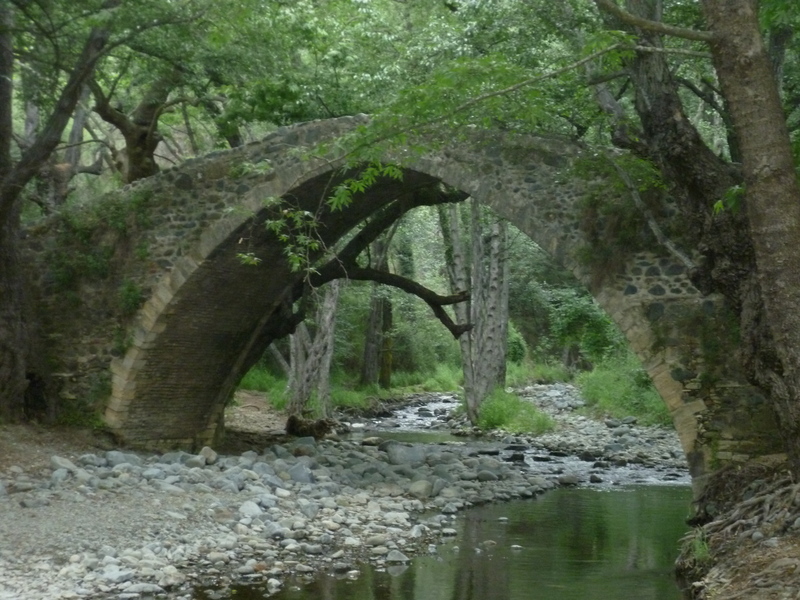 The walk starts from the Kelefos Medieval Bridge situated to the north west of the comparatively well-known village of Omodos. 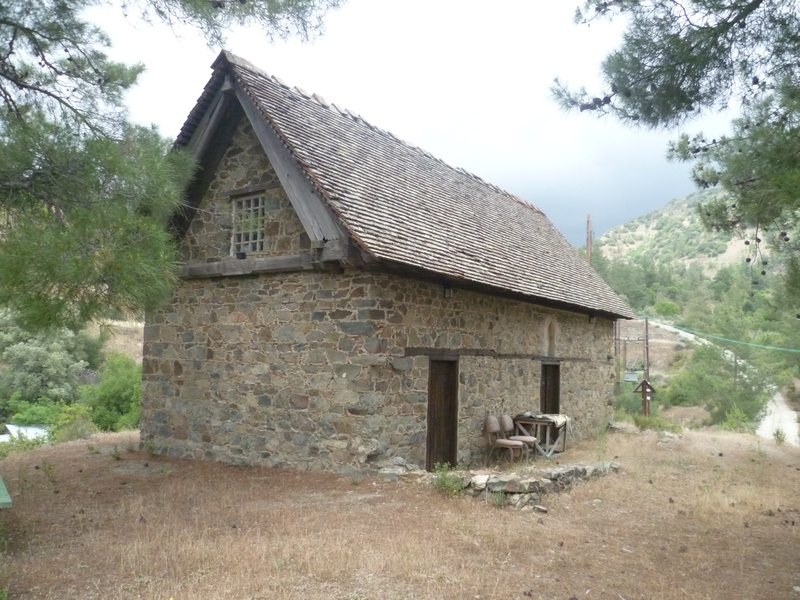 You will need to drive to the small village of Agios Nikolaos on the F620, heading down through the village and following the signs to the bridge, which is situated in the valley bed some 6km beyond. Once there you will see a large area to park your car. Your walk starts here. Near the car park is a sign directing you to the Komititzi picnic site (12km). 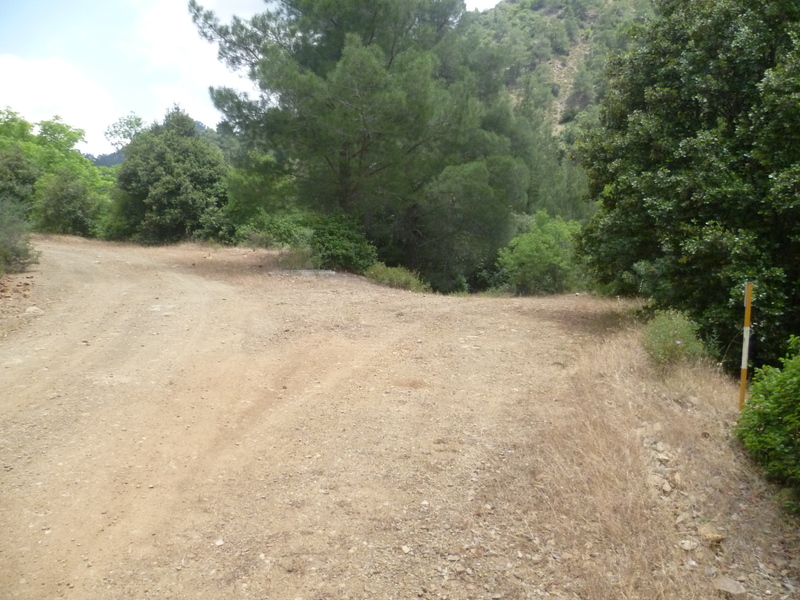 For the time being this direction is also the road to Milikouri and to Kaminaria. 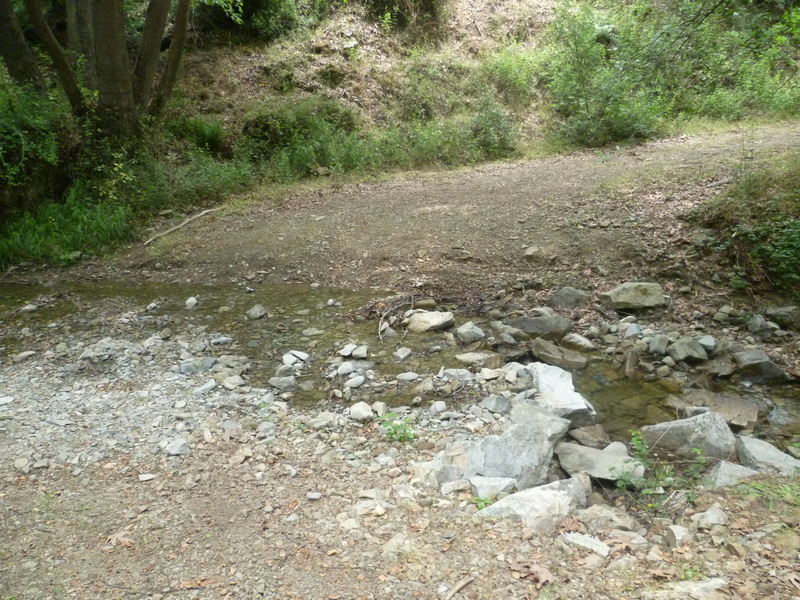 You will be walking up a quiet and pleasant country road with the River Platys on your left. 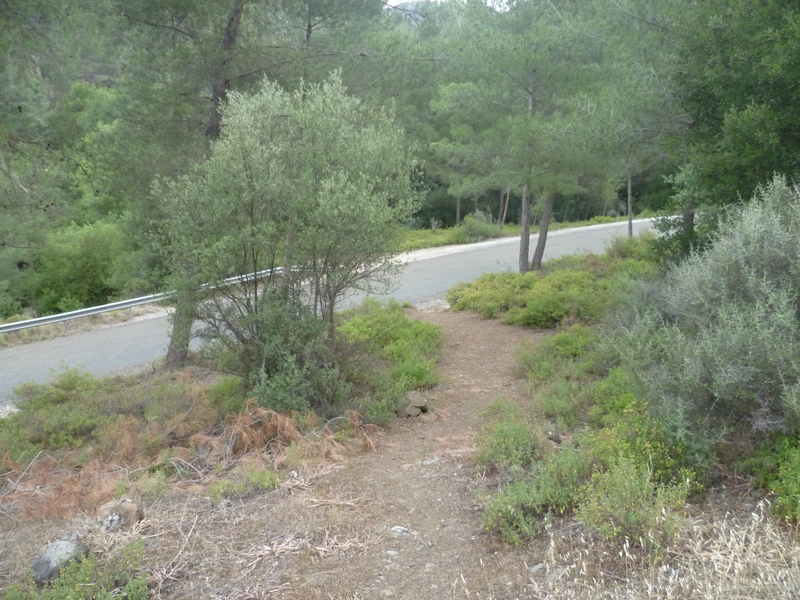 After about 20 minutes of comparatively easy uphill walking you will come to a junction. Turn left here, following the green signs directing you to ‘Mylikouri 12km’ and ‘Picnic Site Komititzi 10 km’. You are now on an earth track which drops steeply down to the river below. Very soon you cross a pair of concrete bridges over the river. The path leads into deciduous woodland following a clearly-defined path which keeps the river to its right. There is little opportunity to go astray at this point. The track winds its way through beautiful woodland, hugging the course of the river and providing easy walking. The trees were alive with birdsong when we walked this route and the only other sound was the crashing of the water as it flowed over rocks and down a series of mini waterfalls. …and a quarter of an hour later – at 1 hour 50 minutes – you will reach a signed T-junction. 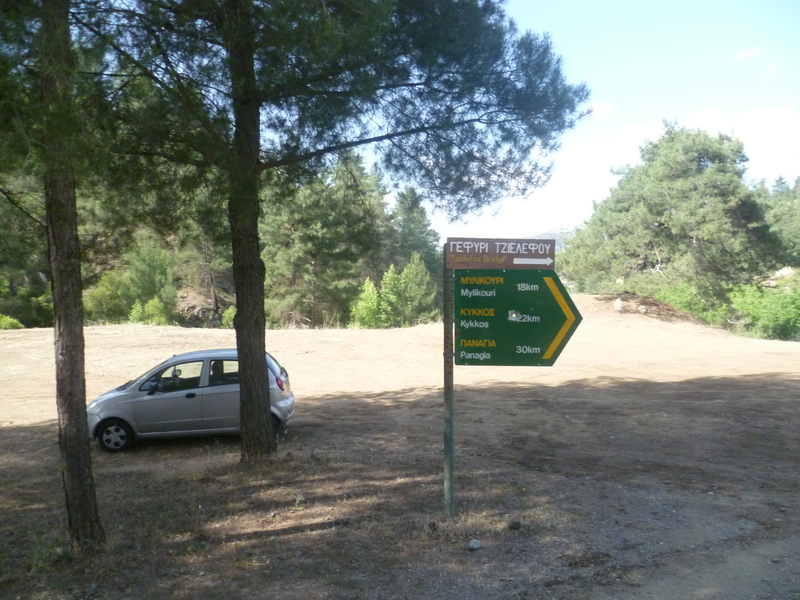 You will need to turn right here, following the signs to ‘Komitigi Picnic Site 1.5 km’ and to ‘Kykkos 15 km’. You are now on the E4 European Long Distance Path. We had to ford a small stream at the junction but thereafter continued walking through a clearly-defined woodland path, arriving at the Komititzi picnic site after 2 hours 10 minutes. 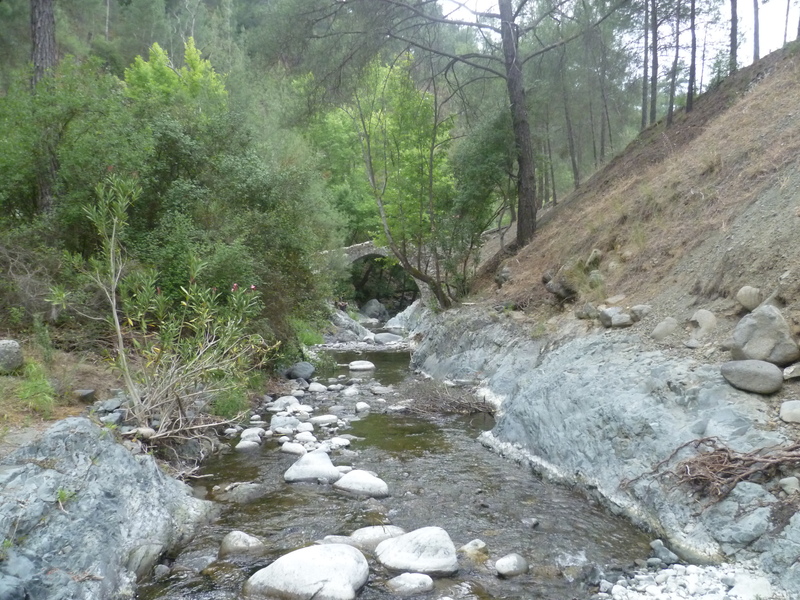 At this point the Mylikouri and Pyknopitia rivers converge to become the Platys river. When you have taken advantage of the picnic benches (note there is no drinking water available at this site) continue past Komititzi along the earth road which continues gently uphill. There is no immediate E4 sign to point the way from Komititzi but keep the stream on your right, albeit far below as your path climbs along the side of the valley. After about 10 minutes’ walking you will pass an E4 sign to your right. 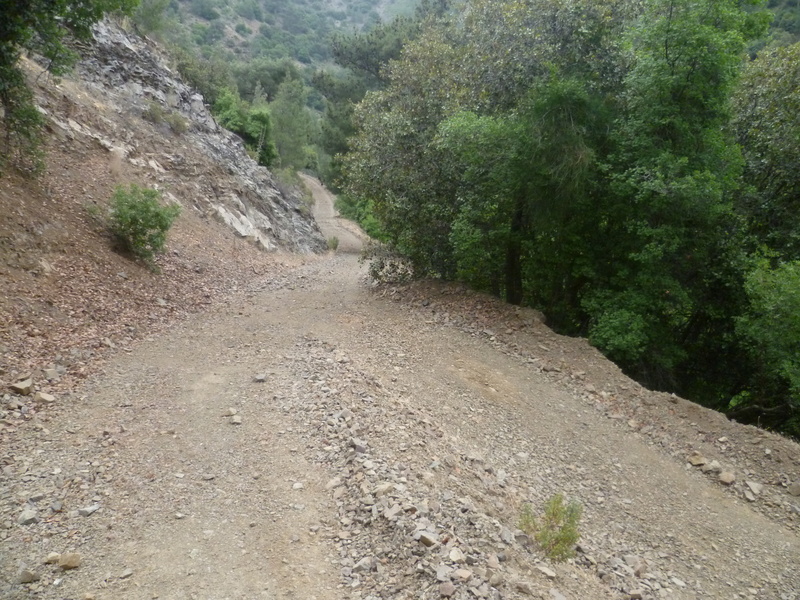 One kilometre from Komitizi (2 hours 30 minutes) you reach a fork in the earth road. 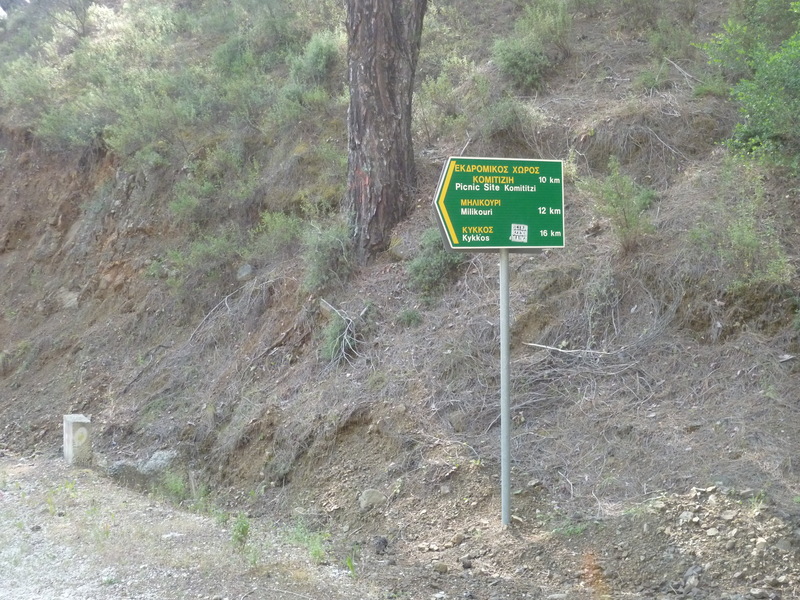 There are E4 signs here including one pointing back to the picnic site. Continue along the E4 by taking the right hand fork and heading downhill. Four minutes later you will reach the river bed. Your path crosses the river (there could be quite a lot of water here in winter, but as you can see there was no problem in June) and then turns 360 degrees to climb up the other side of the valley. As the path rises steadily the views across the neighbouring hills and valleys become increasingly impressive. Continue along the earth road. At 2 hours 55 minutes you will reach a junction with a sharp dog-leg heading downhill to your right. There is an E4 sign here but it is potentially confusing. IGNORE the dog-leg track and keep walking straight on. A couple of minutes later you will be walking past a chain link fence on your right which you can actually be seen from the junction. Keep walking on the main track. It heads briefly downhill before doubling back on itself and winding uphill again with farmland below to the right. 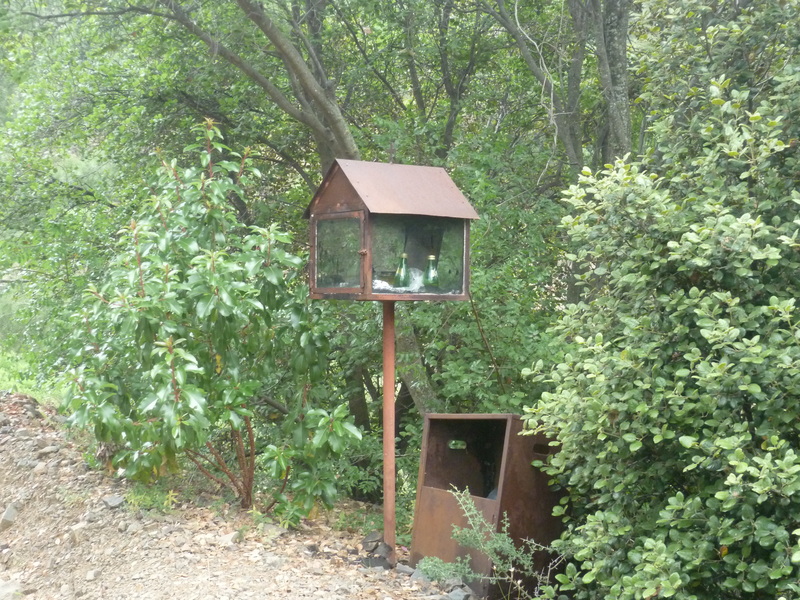 At 3 hours 10 minutes you will walk past this little shrine at the side of the track. The CTO map shows a church somewhere near here dedicated to Profitis Ilias. We couldn’t find it the first time we walked this route but have since spotted it in the distance , high above the path. The views of the valley below you are sensational. It feels very remote here. After 3 hours 30 minutes a concrete road briefly replaces the earth track as you pass a cherry orchard on your right. 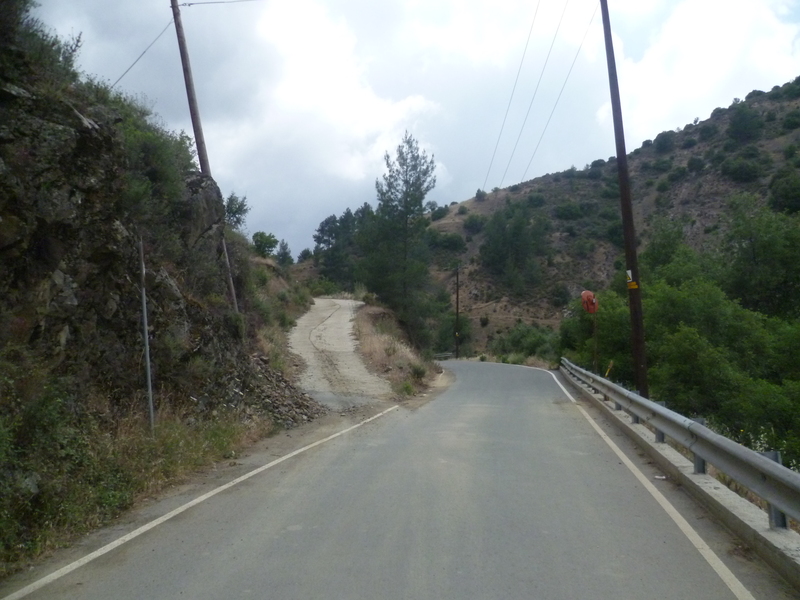 The road climbs quite steeply here for a couple of minutes, then you will reach a junction at the saddle of the hill. Take the right hand fork, following the E4 signpost. The track starts to wind down the side of the hill, through vineyards and orchards and in just a few minutes, heading downhill and ignoring any tracks to left or right, you will be able to see the other church marked on the CTO map; Agios Vasileios. Reach this tiny 16th Century church at 3 hours 40 minutes. There are some pleasant shady benches here. Continuing downhill and still on the E4 you will soon see the village of Kaminaria below you. 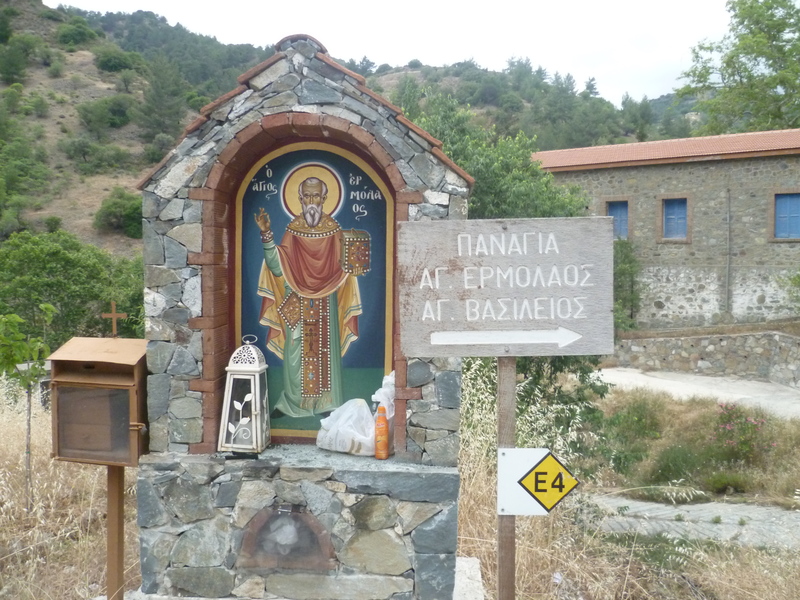 As you reach the outskirts of the village at 3 hours 55 minutes you will pass this shrine to Agios Ermolaos. Continue downhill on the main street through the sleepy village of Kaminaria where there are a couple of coffee shops (one of which is usually open!) and a drinking water supply (always working…so far!). Leave the village on the road which heads down the valley. You will pass a shrine to St George at the roadside and at 4 hours 20 minutes you will reach a junction where a concrete road heads to your left. 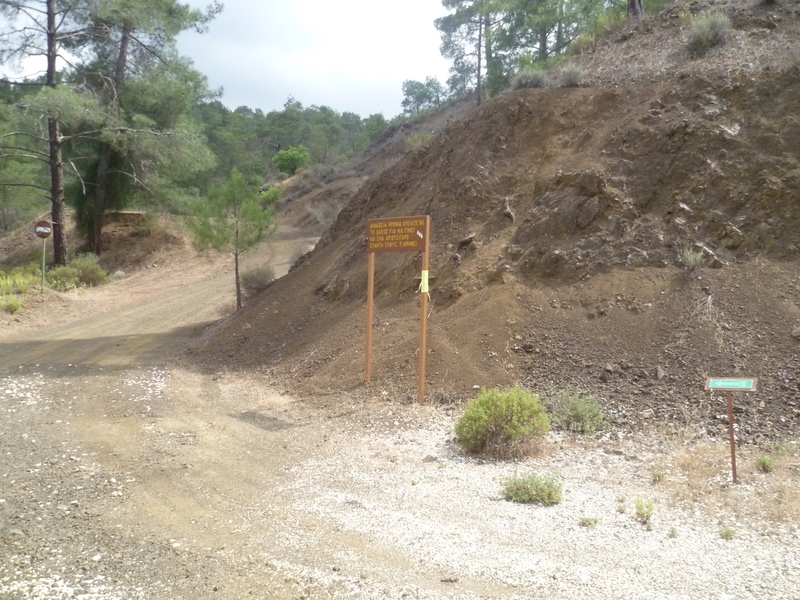 This concrete road is the E4 route to Agios Georgios – not our destination for this walk. 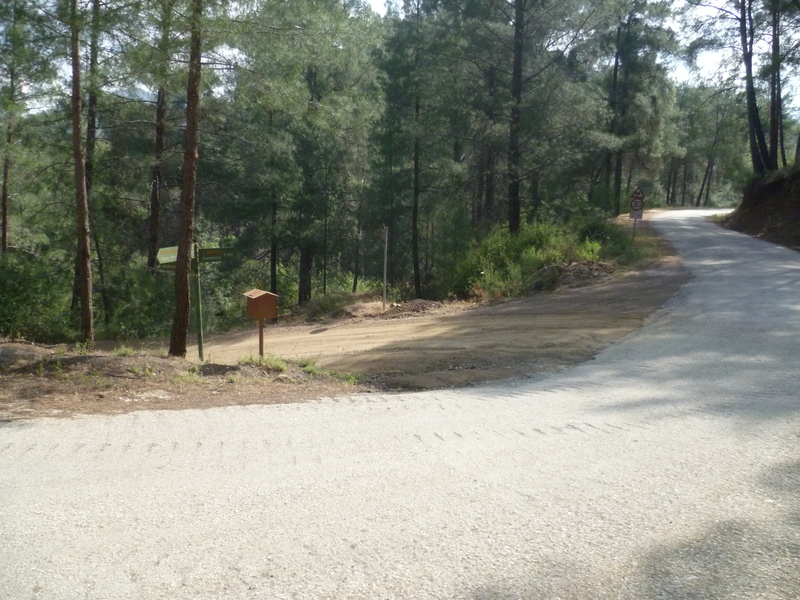 So now you leave the E4 and continue along the asphalt road downhill. You will walk down this road for about 45 minutes. It is very quiet and you are unlikely to encounter much traffic. Once when we were walking along here a lovely couple emerged from their orchard and handed us a bag of cherries. Delicious. At 5 hours 5 minutes you will reach Elias Bridge, a very pretty spot where you will probably see frogs and, if you are lucky, freshwater crabs basking on the rocks. 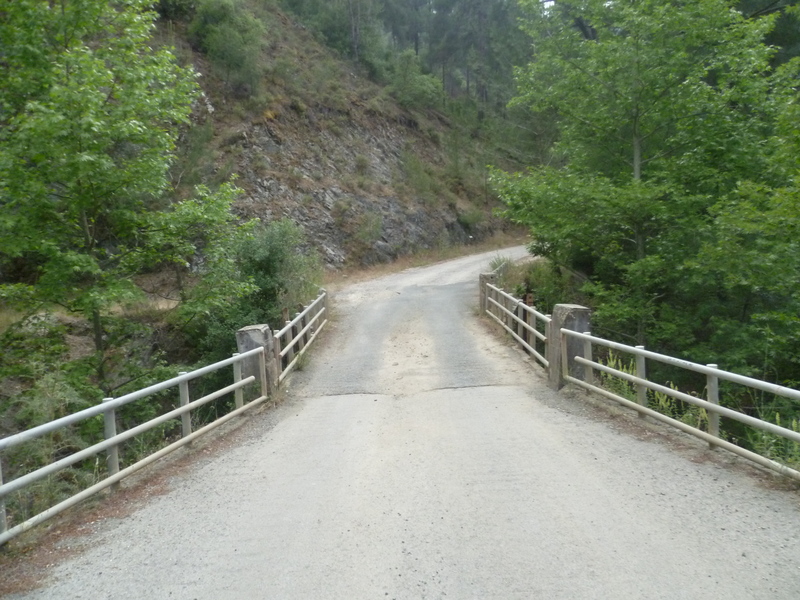 When you are ready to continue, walk back to the road and with your back to the bridge, turn left, heading downhill and after a couple of minutes crossing the road bridge. You are on the Venetian Bridges Nature Trail. For 15 minutes you will continue along the asphalt road but it really is very quiet indeed and follows the course of the stream to your right – very pretty. 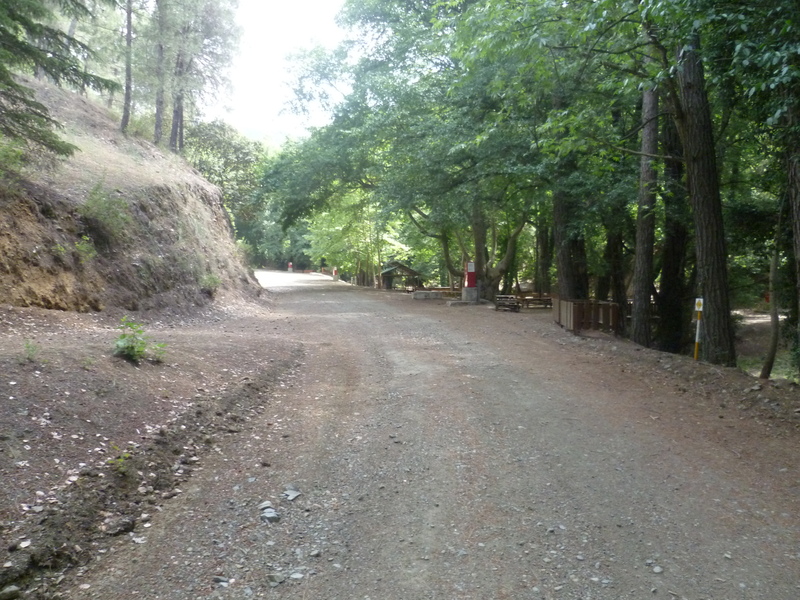 At 5 hours 20 minutes the nature trail leaves the road and heads into the forest to your left. Follow the well signed path as it climbs, then descends through the woods. 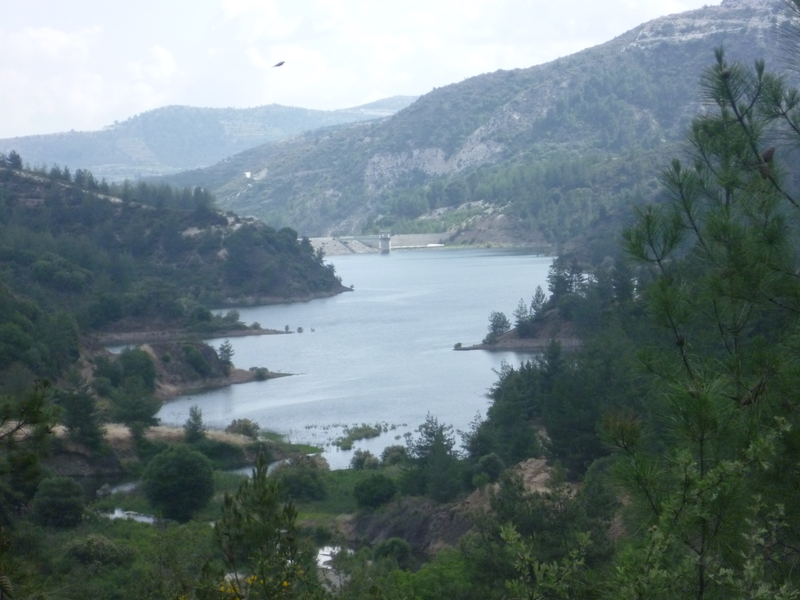 You will catch glimpses of Arminou Dam and reservoir through the trees. 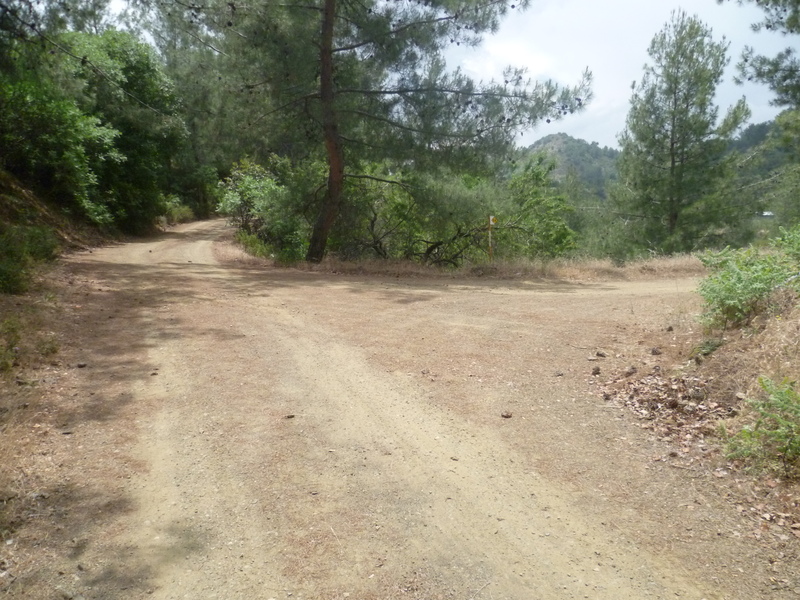 At 5 hours 50 minutes your path crosses the road……. 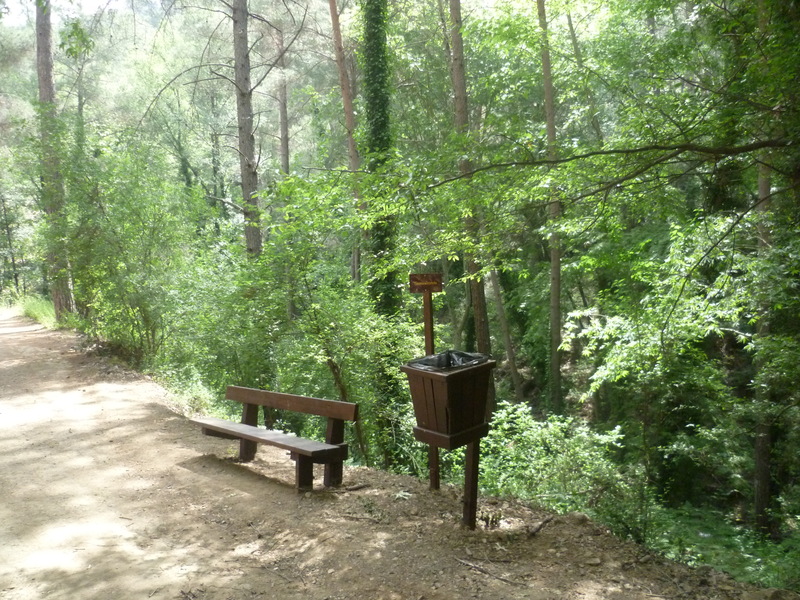 …….to return you – within a couple of minutes – to your starting point at Kelefos Bridge.